A couple years ago, I had a goal of predominantly featuring old (1908-1913) Sears houses on this site. 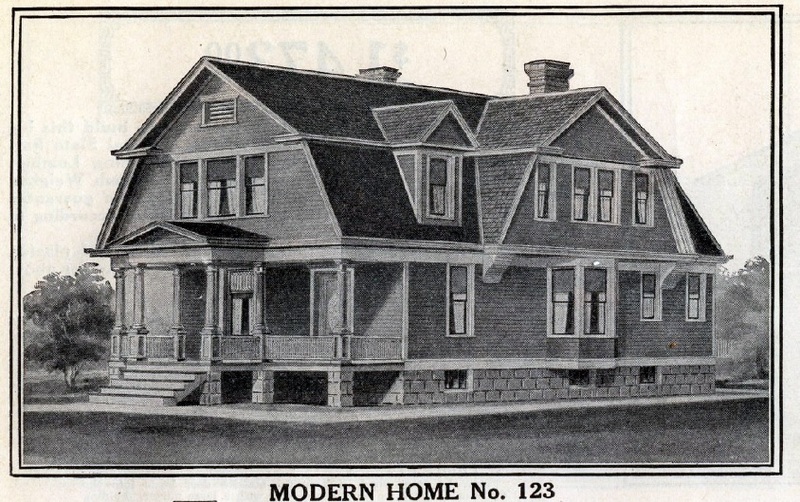 However, the early model Sears homes are tough to come by in the Chicago area. Part of the reason is that Sears Roebuck simply didn't sell as many kit houses in that time period, as the Modern Homes business was still getting off the ground. Additionally, Sears did not offer mortgages before 1911, which complicated purchases for customers since they needed to pay cash for a house or find financing from a local bank. I think another reason we rarely see old Sears models is that houses built from 1908-1913 in the older suburbs tended to be located in areas that were part of of suburban downtown redevelopment efforts and were consequently razed. And, as a matter of course, many houses over 100 years old in residential areas tend to be demolished and replaced by McMansions or new construction. I've found pre-1914 Sears houses in places like the Norwood Park neighborhood of Chicago, Glencoe, Des Plaines, Woodstock, and now, Brookfield. 4160 Raymond Ave., Brookfield. Capture from Google Streetview. No. 123 from the 1914 Modern Homes catalog. In the early days, Sears didn't have names for their houses--they had numbers. I was looking for a house in Brookfield, and inadvertently stumbled across this stunning No. 123. That's a "fancy" leaded glass window in the living room, according to the catalog. The house came standard with cypress siding and cedar shingles. Capture from Google Streetview. The No. 123 was not the most expensive house Sears was selling at the time, but it was definitely one of the more expensive models. The house featured two staircases, a large reception hall, and a large kitchen and pantry. 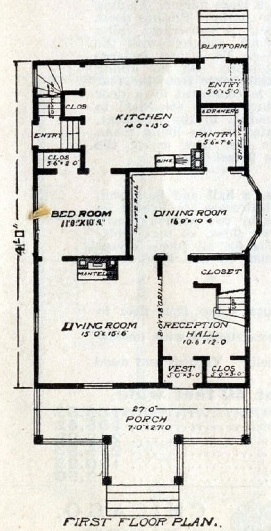 Sears advised that the first floor bedroom could also be used as a library. 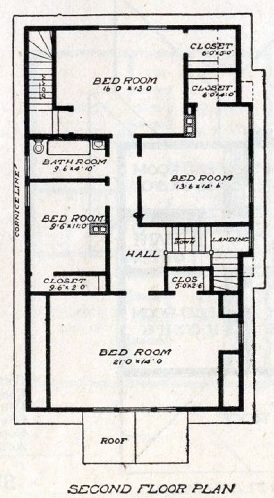 Four bedrooms on the second floor and a bathroom. No outhouse needed! This No. 123 in Brookfield was one of the first Sears houses sold in the Chicago area. It is located in the Congress Park area of town. Henry and Nellie Zwergel purchased it in 1909. Sears said that the price of the house was $1,073, and if you hired a contractor to build it, the cost would be $2,578. Henry was a retired "day laborer", but apparently he had some bucks. Henry died in 1910, and Nellie died in 1919. However, four of their adult children continued to live in the house. Three of them passed away in 1949. The fourth, Gertrude Zwergel, sold the house in 1951, and she died a few years afterwards. So the Zwergel family owned the house for 42 years altogether. The family who purchased the home from the Zwergels still own the house to this day (2019)! This must be one special house. According to the current owner, the house inside looks largely as it did when it was built. There is one other No. 123 in Illinois, and it is in Joliet. Author Rebecca Hunter located this one. 617 Buell, Joliet. Capture from Google Streetview. The No. 123 in Joliet was built around 1916. The original owners were retirees Charles and Ida Schmuhl. The earlier (pre-1920's) gambrel-roofed houses have always seemed more interesting to me; this example is very appealing. It's somewhat coincidental that both of the examples you show were re-sided mid-century, though in different colors. How nice that you found this house when you weren't looking for it... many excellent discoveries are similarly serendipitous! This is one of my family members home. It has been beautifully maintained.